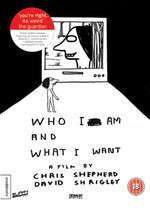 Who I Am And What I Want is a 7 minute animated short directed by Chris Shepherd and David Shrigley in 2005. Based on the David Shrigley book of the same title. Kevin Eldon voices the role of the film's main character, Pete.